Instructions: Red patterned paper is the background. Cut white cardstock to 11x11". Cut black cardstock to 10.75x10.75". Adhere these layers together. Cut a strip of the striped patterned paper, and adhere down the middle of the layout. Using a dinner plate I traced and cut out a circle from green patterned paper. Cut a scalloped circle from white cardstock, and a slightly larger circle from black cardstock. Use a slightly smaller die to cut out the photo. Adhere the photo to the white scalloped circle. Adhere these to the black circle using 3D foam squares. Adhere to the layout also using 3D foam squares. Add the title using foam letters and sticker word. Using black ink and the Fanciful Carnation stamps stamp the images onto white cardstock. Die cut them out. Adhere to the layout without shaping using 3D foam squares. 2 down in the bottom right hand corner, and 1 partial image in the top left hand corner. Add pearls evenly spaced all the way around the green patterned circle. Stamp all of the Small Camelia Carnation floral pieces. For the red and orange carnations I stamped in brown ink, for the light and dark pink carnations I used pink ink. I added color to the pink and orange carnations using inks and daubers: orange (Spiced Marmalade), dark pink (Berrylicious), light pink (Blush). I added color to the red carnation using a Chameleon Pen and Chameleon Color Top (RD4 Crimson Red pen, RD5 Burgundy Color Top) using a 3 to 5 second blend depending on petal size. 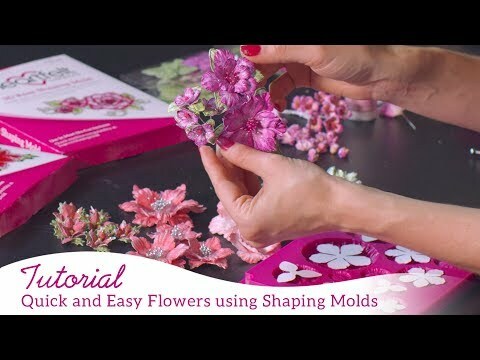 Shape the flowers using the 3D Floral Basics Mold, then a little additional tweaking using the Deluxe Flower Shaping Kit. Assemble flowers. Adhere a large cluster of flowers in the bottom right hand corner. Adhere 2 smaller flowers to the top left hand corner. Stamp the Happy Memories sentiment on light green patterned paper using black ink. Cut it out and flag one end. Adhere tucked into the large flower cluster in the bottom right hand corner of the layout.